Did you know these Monterey Peninsula facts? 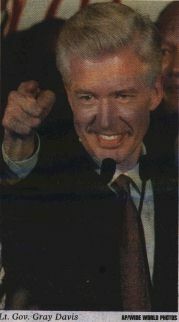 Gray Davis and Dan Lungren have sparred over abortion, gun control, capital punishment, tobacco and the environment. Davis accuses his conservative Republican opponent of holding beliefs too far out of the mainstream for California voters. The attorney general paints his Democratic opponent as a liberal politician who says one thing and does another. As the California gubernatorial candidates enter the height of the campaign season, they also differ on retaining two California Supreme Court justices and how to resolve the State Bar's predicament. Each is cautious about tinkering with the jury system, supports a strong Three Strikes law and thinks the governor can help restore public confidence in the legal system. Despite Davis' claims that he has always supported the death penalty, the tough-on-crime attorney general has accused Davis of helping to carry out policies that were in opposition to capital punishment when he served as former Gov. 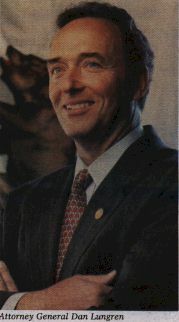 Jerry Brown's chief of staff. "When does always' mean always?' " Lungren asked in their July 31 debate. "It means always," Davis responded. Each year, California Bar Journal publishes a special issue previewing the bar's upcoming Annual Meeting. This year's meeting will be held in Monterey Oct. 1-4. This special issue includes information on the meeting as well as profiles of candidates seeking the bar presidency and five open board of governors seats. 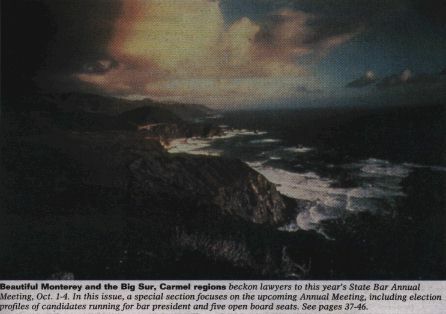 Beautiful Monterey and the Big Sur, Carmel regions beckon lawyers to this year's State Bar Annual Meeting, Oct. 1-4. In this issue, a special section focuses on the upcoming Annual meeting, including election profiles of candidates running for bar president and five open board seats.